As bullfighting is banned in practice, it finds a survival in turning into theory. Here a Professor of Bullfighting explaining Advanced Fighting Strategies. Yes, bulls are hard-wired to rip and gore things with their horns, so it's good to see that they now have classes to help them better understand why they love trampling and killing things. There's nothing like an engaging classroom experience to satisfy any primal need. The only place its banned in Spain is is Catalunia I think. 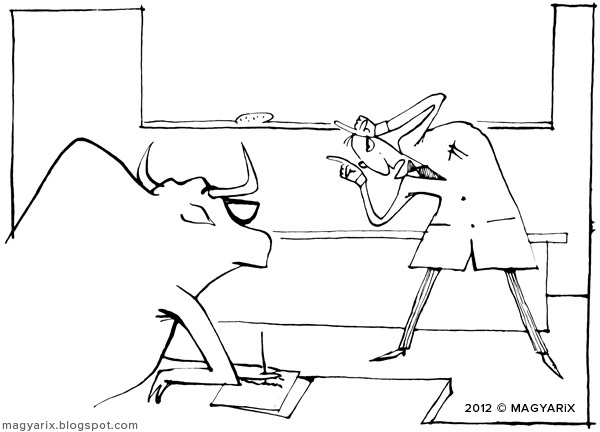 I hope the teacher is good because there is nothing more satisfying than seeing the bull win! I think I'm picking up a few tips from that very involved teacher myself! I love the way you framed this drawing with objects in the room and the bull. Can I use that idea?